When deciding on which type of roof warranty will work best for your residence, you will typically have several factors to consider: coverage that protects against workmanship errors, and coverage that protects against manufacturing defects in the materials. Workmanship Errors: Most contractors who work on roofs will typically provide their own warranty against errors in workmanship. This means that if any of your roofing materials become defective due to how they were installed or because of workmanship, you will have coverage. However, workmanship specific warranties typically are shorter in length than other types of warranties, with most offering 2 years of coverage. Zenith Roofing offers the Zenith Roof Smart Plan (ZRSP) warranty on all residential projects. This warranty is 5 years, which is 3 years longer than the typical contractor warranty of 2 years. This warranty includes 1 to 2 inspections per year depending on the program you choose, which includes repairs to any warrantied defects discovered. The inspector will also perform standard workmanship maintenance to the roof while on site. We also offer free inspections after storms and catastrophes. After each inspection, Zenith provides the owner with a written condition report and photos. Why is maintenance so important? It’s just like a new car warranty, the manufacturer gives you a specific amount of years and miles. They require oil changes, water in the radiator, simple things that must be maintained. The roof is similar in that it requires yearly maintenance. If this maintenance is not completed correctly, not only can this void your manufacturer’s warranty, but can lead to major structural and interior damage. The risk and cost is too great. Inspecting and maintaining your roof is a necessity. We have been asked by many of our clients why we hold a 5 year warranty as opposed to a more common roofer’s 2 year warranty. In the majority of cases, manufacturers do not inspect the finished project, so the burden of quality control falls on the roofer. Most workmanship issues arise during the first major weather incident or during the first calendar year after installation. History shows without maintenance in approximately 3-4 years wear and tear issues can surface. For these reasons, we hold to our commitment and not only warrant our work but maintain your roof for 5 years with the option to extend at the end of your standard contract warranty. Manufacturing Defects: All roofing components should come with a manufacturer’s warranty that is specific to the product. Therefore, if the roofing material fails due to a warranty defect during the covered period, you should still have coverage. While the type & length of warranty will vary by each brand and manufacturer, each warranty has its own specific terms, so be sure to read the fine print carefully. (Make sure your roofer explains your warranty in detail.) In addition to the standard warranty, some manufacturers have developed extended warranty programs which can include workmanship. These programs require that the contractor be approved and certified. Zenith is a certified contractor for all the major national manufacturers. Even after receiving a certified warranty, most manufacturers still don’t inspect the roof. They are dependent on the workmanship of the certified contractor. 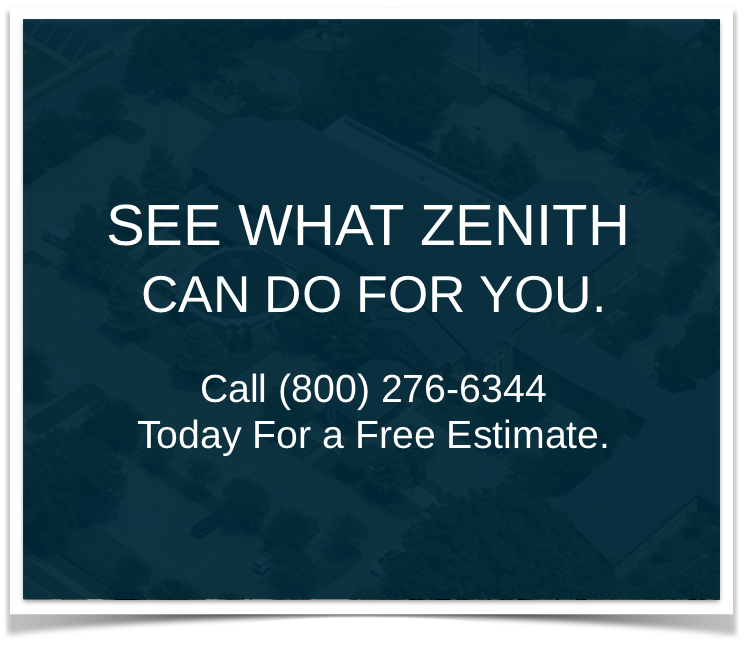 When the roof is complete, Zenith offers what we believe is the most comprehensive roof inspection warranty program in the industry. Every roof is inspected by not only the foreman on the job, but also by a quality control representative with a written in-depth punchlist.